These are links we’ve found helpful, important, and interesting. This list will expand as we become aware of more sites that offer good information about orchids or orchid growing, area orchid societies, local Arkansas community websites related to the plant nursery industry, flowers… You get the idea. A member of the Cattleya Alliance, Pot. Hoku Gem ‘ Freckles’, shown here, remains short and compact, perfect for the smaller growing area that receives plenty of light. 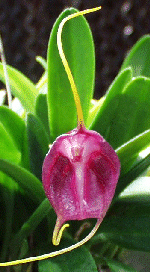 American Orchid Society: Sponsors and conducts orchid research worldwide. In the U.S., the orchid judging authority. A wealth of information. Definitely worth the yearly membership fee. Royal Horticultural Society: Founded in 1804, this is “Big Mama.” Orchids with FCC (First Class Certificate) awards from both the RHS and the AOS are specimen plants and command very high prices. Good source of information on all types of gardening subjects. Orchid Society of the Ozarks: Our local orchid society we’re very proud to be part of. *This* Society is the one to join for cultural info, an awesome monthly newsletter, and a great group of folks interested in furthering orchid knowledge. Royal Botanic Gardens, Kew Much orchid research underway. Check them out. Masdevalia orchids like these remain tiny. They’re not quite “miniatures” but, rarely exceeding 4-5 inches in height, they make excellent gifts for people with limited growing space. The Orchid Photo Page Stunning orchid photos from AOS judging and private collections. American Journal of Botany Excellent resource to browse through and examine. Scientific in nature. Phylogenetic Analysis: MacLade Orchids are evolving before our eyes. This software analyzes and explores phylogenetic hypotheses and character evolution. Not for the layperson. Demo version for free download. Marie Selby Botanical Gardens Research and conservation programs headquartered in Florida. Definitely worth a look. Jason Chang’s Orchid Page Excellent photographs and descriptions of many rare and difficult to grow species. Shows how you can grow if you put some dedication and perseverance into it. Wonderful work. Orchids Alive in Zone 5 is an ongoing commentary by an orchid hobbyist living in Kansas City, Missouri, about growing and blooming tropical orchids. The Sierra Club We really enjoy traveling and exploring; though these folks direct their efforts at a wide variety of projects besides orchids, they’re still our favorite conservation group.